Benazecare There are 2 products. Benazecare Tablets are pale yellow film-coated divisible oval tablets manufactured by Animalcare. Each Benazecare tablet contains either 5mg or 20mg benazepril hydrochloride. How do Benazecare Tablets work? After oral administration Benazecare is rapidly absorbed from the gastrointestinal tract and hydrolysed into benazeprilat a highly specific and potent inhibitor of angiotensin converting enzyme (ACE). Benazeprilat produces significant inhibition of plasma ACE activity for more than 24 hours after a single dose in both dogs and cats. Inhibition of ACE leads to a reduced conversion of inactive angiotensin I into angiotensin II and therefore reduction in the effects mediated by angiotensin II including vasoconstriction of both arteries and veins retention of sodium and water by the kidney and remodelling effects (including pathological cardiac hypertrophy and degenerative renal changes). What is Benazecare used for? 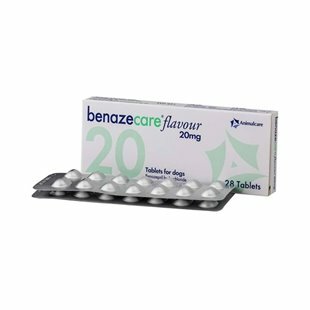 Benazecare Tablets are indicated for the treatment of congestive heart failure in dogs and the treatment of chronic renal insufficiency in cats. In dogs with heart failure Benazecare lowers the blood pressure and volume loading effect on the heart. In cats with renal insufficiency Benazecare reduces the protein loss in urine and normalises the elevated glomerular capillary pressure and reduces systemic blood pressure. Reduction in glomerular hypertension retards the progression of kidney disease by inhibition of further damage to the kidneys. Benazecare has been shown to increase the appetite quality of life and the survival time of cats particularly in advanced disease.